We could not be more thrilled to introduce PST's 47th season -- a series of four challenging, engaging, and entertaining plays. This summer’s season explores the theme of “the Other.” Each show in our season peers into the other side of a story or character, bringing us to new depths of understanding of these multifaceted tales and beings. Theater allows us to see what people might not reveal instinctively, giving us a new perspective on what was once familiar. Each show in our season provides a powerful take on noticing and appreciating the differences in us all. We are so looking forward to you joining us! Assassins is an explosive tale of the American Dream gone awry. A multiple Tony Award-winning musical, Assassins combines Sondheim’s brilliant lyricism and rich music in a revue-style tale addressing our nation’s culture of celebrity and the violent means taken to obtain it. Clever, original, dark, and surprisingly funny, Assassins is perhaps Sondheim’s most controversial musical. After a playground fight erupts between their two young sons, two sets of parents are brought together in a meeting to resolve the matter. While they play nice at first, they soon devolve into outlandish, bickering children themselves. The 2009 Tony Award-Winner for Best Play, Yasmina Reza’s God of Carnage is an energetic and hilarious triumph, showing us what is underneath the polite facade of these upper class adults. Praised as Tom Stoppard’s modern dramatic masterpiece, Rosencrantz and Guildenstern Are Dead is a wonderfully inventive behind the scenes look into Shakespeare’s Hamlet. Told through the worm’s-eye view of the once minor characters Rosencrantz and Guildenstern, Stoppard’s play takes us to a place where reality and illusion intermix. Join the protagonists on an absurdist tale of musings and misadventures as they discover their inevitable fate. Winner of multiple Obie Awards, Sam Shepard’s dramedy unfolds in a motel room in the Mojave Desert in which we find the continuously bickering former lovers May and Eddie. There, they unravel their tangled relationship, almost tearing each other apart. A dark exploration into love and family, Fool for Love shows us how our pasts surely come back to haunt us. In addition to our four main stage shows, PST also will present its annual Children's Show. Stay tuned for more information on our children's programming! Hi there! I'm Phil, and I'm incredibly excited to be a guest artist for PST's production of The Real Inspector Hound. I graduated from Princeton in 2014. While on campus, I was very involved in student theater and was on the board of Theatre Intime. I now live in New York, where I am pursuing a career in acting and preparing for MFA acting program auditions. The main company of PST is a lovely group, and I have very much felt like a part of the company even though I came in halfway through the season. Rehearsal for the one acts has been insanely fun. Brad and the rest of the company made it very easy for everyone to embrace their silly side and try out daring ideas and then refine them. With such a talented and quirky cast, it wasn't uncommon at all for everyone to break out laughing in the middle of a rehearsal. This has been one of my favorite shows to work on, and I hope that the fun we had in the rehearsal process shows through in the final performance. Hello everyone! My name is Dan Caprera and I am delighted to be playing the eponymous Inspector Hound in PST’s upcoming production of Tom Stoppard’s The Real Inspector Hound, directed by the inimitable Bradley Wilson. As a guest artist, I only got on campus a few weeks ago, but I quickly jumped into PST’s twelve hour rehearsal schedule with aplomb and fierce, driving ambition. This specific play was of particular interest to me since I have been interested in the cliched, formulaic construction of “traditional” murder mysteries for many years. One of the most interesting elements about The Real Inspector Hound is the ways in which it thoroughly and handily upends the conventions of the stereotypical Agatha Christie whodunnit. More precisely, this play acts as a way for Stoppard to lampoon Agatha Christie’s presentation of the “unsolvable” mystery. Working on this play has been a delight, and if you enjoy watching the show even 1/10th as much as I enjoyed working on it, you will have a fantastic night out! Enjoy the show! Hey there! The name’s Jake, and I have the esteemed pleasure of creating Professor Henry Higgins’ of Pygmalion on the proud PST stage. As a guest artist, I jumped late into a team that had already bonded over weeks of exhausting yet invigorating theater work. Unlike these courageous artists, who have to juggle the entire PST season in their brains (4 MainStage productions, a children’s show, as well as workshop programming), my sole task was to put my every effort into bringing the eccentric, eclectic, neurotic, charming, alarming, sensitive and senseless Henry Higgins to life. The mission was daunting, but luckily I knew I had the brilliant artists of the PST ensemble at my side and the passionate and sagacious mind of director R. N. (Bob) Sandberg leading the charge. Bob and I go way back—in fact, I have done more theater work with him than any other director I’ve known. From Chekhov’s Uncle Vanya to Paula Vogel’s How I Learned to Drive to my one-man acting thesis Madman/Robertson, an actor-director collaboration was forged, for which I am supremely grateful. Bob and I discussed at length our ideas about who Higgins was in the context of his greater vision for the piece—he told me that in fact it was Higgins’ transformation that was the most fundamental throughout the course of the play. Our mission was to tackle this transformation by finding the moments of realism within Higgins’ story. He could be easily played as a caricature of the eccentric genius, but we decided that he was, rather, a socially awkward, often childish man, scared very much of his own feelings. And so, our production—set as a memory play in which Higgins relives his past with Eliza—serves as the means by which this insecure and co-dependent momma’s boy-genius grows up and learns to confront his world and his self in a mature and responsible way. Come see an unbelievable cast and crew bring a little heart to the inimitable mind of George Bernard Shaw! Hi there! My name is Bits Sola. This is my first summer here at PST, and goodness me what a wild ride it has been! A recent graduate of Princeton’s class of 2015, I majored in Italian with a certificate in Theater. I'm so very excited to be a part of the team here at PST. Working on Pygmalion over the past couple of weeks has been a blur of dialect coaching and costume skirts, with laughs and hard work going into each and every rehearsal. A total change of pace from our ensemble piece Metamorphoses, this show has caused us to live in a different kind of theater space. Pygmalion is a play of intellect and ideas: the characters are as much representatives of a way of life, of a socio-economic class, as they are individuals in their own right. Of course, to some degree all characters in all plays must be a combination of both idea and human being in order to be accessible; human beings are products of situations and interactions, but Shaw tells the story of English society in a uniquely poignant manner. Perhaps the most important part of this process has been trying to understand the delicate balance between caricature and reality, between the superficial differences and those that run more deeply, from one character to the next. And what is there to say about the boisterous and enigmatic Eliza Doolittle? I've certainly had my hands full these past two weeks working to decipher the inner life of this complex woman. So far I’ve found the process to be hugely fulfilling and challenging, on both an emotional and intellectual level. Luckily I've had the whole team here to help me, and I am confident this ensemble will be able to tell yet another dynamic story on stage over the next few weeks. Pygmalion, the second show of Princeton Summer Theater’s 2015 season, opens tomorrow at the Hamilton Murray Theater on Princeton University’s Campus. This timeless comedy by George Bernard Shaw is a sharply funny commentary on class, gender, and what it means to be true to yourself. This vibrant and hilarious new production adapted and directed by Princeton lecturer in Theater and English R. N. Sandberg highlights the battle of wits and wills between Henry Higgins and Eliza Doolittle. Speech professor Henry Higgins makes a bet that he can transform cockney flower girl Eliza Doolittle from a low-class nobody to the toast of society at an upcoming garden party. He soon realizes, however, that this feat might not be so easily accomplished; Eliza has strong opinions of her own, and she is prepared to fight Henry every step of the way on her transformation from street urchin to sophisticated duchess. The inspiration for the musical My Fair Lady, the story of Pygmalion has captivated audiences for decades. Starring guest artist Jake Robertson as Henry Higgins and Princeton Summer Theater company member Bits Sola as Eliza Doolittle. Also featuring Ross Barron (Pickering), Maeve Brady (Mrs. Higgins), Sarah Cuneo (Mrs. Eynsford Hill) Caroline Hertz (Mrs. Pearce/Miss Eynsford Hill), Kanoa Mulling (Freddy Eynsford Hill), and Evan Thompson (Mr. Doolittle). Pygmalion by George Bernard Shaw, directed by Princeton University lecturer in Theater and English R.N. Sandberg. Opens Friday, July 3. Performances run July 3-5, 8-12, and 16-19. Thursday-Saturday at 8pm, Saturday and Sunday at 2pm. Wednesday, July 8th at 8pm. Special talkbacks with the cast follow every Friday evening performance: join us on July 4th after the 2pm matinee for a reception with hoagies by Hoagie Haven! Tickets are $27.50 for general admission, $22 for students and matinees. We also offer season subscriptions for only $60 (a 30% discount! ), which ensures a reserved seat for each of our three remaining main stage shows this season. To order tickets, visit http://www.princetonsummertheater.org/ or call the PST box office at 1-732-997-0205. Pyg1: Bits Sola (L) as Eliza Doolittle and Jake Robertson (R) as Henry Higgins in a scene from Pygmalion, opening tomorrow at the Hamilton Murray Theater. 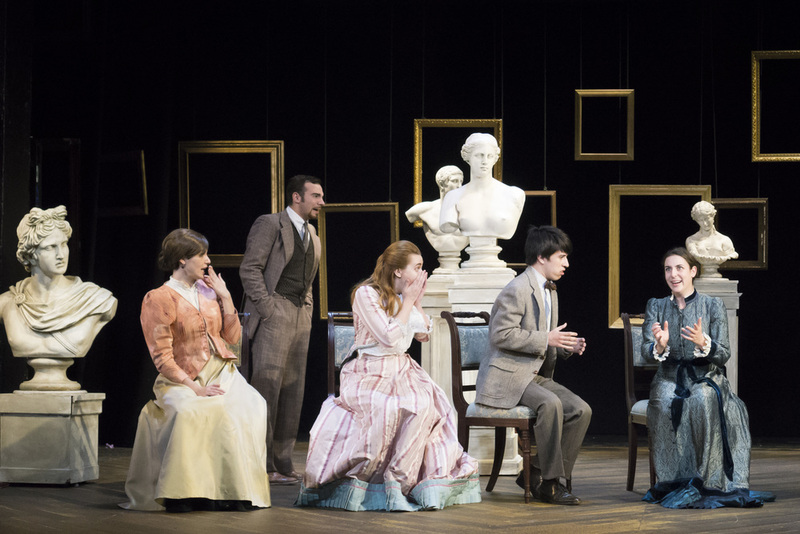 Pyg2: From right to left: Ross Barron as Pickering, Bits Sola as Eliza Doolittle, Jake Robertson as Henry Higgins, and Evan Thompson as Mr. Doolittle in a scene from Pygmalion. Pyg3: Jake Robertson as Henry Higgins in a rehearsal for Pygmalion. Pyg4: From right to left: Sarah Cuneo as Mrs. Eynsford Hill, Jake Robertson as Henry Higgins, Caroline Hertz as Miss Eynsford Hill, Kanoa Mulling as Freddy Eynsford Hill, and Bits Sola as Eliza Doolittle. Our mainstage season is well underway: Metamorphoses closed to rave reviews and build has begun for Pygmalion, directed by Princeton University lecturer, director, and playwright R.N. Sandberg. Amidst all the excitement for this year's season, we want to make sure that you don't miss out on our other projects, including our affordable and educational children's programming. As a company of young artists ourselves, we are so passionate about bringing the magic of theater to young audiences. This year's children's show is The Legendary True Story of Sparrow Jones and the Jersey Devil, a new play for young audiences written by PST veterans Maeli Goren and Brad Wilson and featuring Maeve Brady as our bookish but plucky heroineSparrow Jones! "Have you seen the Jersey Devil? Sparrow Jones has been afraid of it her whole life, so when she finds herself lost in the Pine Barrens, she has to use all her strength, wits and courage to find her way out! Sure to engage audience members of all ages, "The Legendary True Story of Sparrow Jones and the Jersey Devil" is a musical, magical, and interactive journey through New Jersey flora, fauna and folklore." The story of Sparrow Jones & the Jersey Devil is written to help kids think about themselves as participants in a larger world; a world in which they have the power to love their family, home and planet actively and compassionately. Empowering, exuberant, and laugh-out-loud funny, you and your family won't want to miss Sparrow Jones! Tickets for the show are $10, free for children under 3. Shows are at 11am on Thursdays, Fridays, and Saturdays, from July 2-August 8. After each performance, actors come out to meet with children, sign their programs, and talk about the characters and the play! We're also happy to provide discounted group rates and to accommodate parties: just give us a call 1-732-997-0205 or email us at contact@princetonsummertheater.org for more information. We'll also be hosting a series of six Young Artists' Workshops for children ages 6-12. Come learn and play alongside the 2015 PST Company! Over the course of 6 weeks, we''ll explore some of the fundamentals of theater and work together to create our very own show, which we'll perform for family and friends at our last session together. Come to one or come to all -- we always welcome drop-ins! All workshops are Friday afternoons from 1:30-4:30pm, July 3-August 7. Each workshop costs $30 to register -- save 20% by registering for all six workshops for $145! Register by emailing workshops@princetonsummertheater.org. As always, feel free to contact us at 1-732-997-0205 or at contact@princetonsummertheater.org -- we love to hear from you. Hey everyone! My name is Caroline Hertz, and I'm a proud member of the recently graduated Princeton class of 2015. As this is my first summer as company member, it's been a wonderfully insane few weeks getting acclimated to the way things work here at PST. A little bit about me: Originally, I hail from a little semi-rural town in Virginia, and I've spent every summer for as long as I can remember doing theater in some capacity. At Princeton, I studied English and Theater - my acting thesis was Paula Vogel's How I Learned to Drive - and I plan to pursue a career in acting. In addition to my identity as an actor, I'm also an avid horseback rider and a poet. Back in Virginian horse country, I spend a lot of my time training horses and writing embarrassing Facebook poetry. Now that we've closed our first show of the season - Mary Zimmerman's Metamorphoses - our company is eager to fully immerse ourselves in the equally splashy, ridiculous, and prim world of George Bernard Shaw's Pygmalion. I have the absolute pleasure of playing both Mrs. Pierce (Henry Higgins's housekeeper) and Clara Eynsford-Hill. Early on in the process, I made the choice to vocally differentiate my characters by giving Mrs. Pierce a Scottish brogue. As a result, a huge part of my character work for both roles has been dialect-related. It's been an incredibly exacting and challenging process, but a very rewarding one as well! When this summer comes to a close, I plan to take the next year or so for myself to prepare for MFA program auditions. It looks like I'll be working in theater administration in Philadelphia and using the weekends to audition for regional theater companies in the area. PST has been a fantastic transition between the world of college theater and the world of professional theater. Here within the walls of the Hamilton-Murray Theater, I'm learning all about how to be a member of a company of actors, how to budget myself on an actor's salary, and how to take care of my voice and body so that I can successfully carry out performances every weekend. And when, in a few short weeks, I officially enter the world of professional theater, I'll wear my experiences here at PST as a badge of honor. Metamorphoses: The Reviews are In! Critics and audience members alike are raving about Metamorphoses at Princeton Summer Theater. Hear what they have to say, and then get your tickets today! Read the full reviews here: Broadway World; Town Topics; U.S.1. Howdy! I’m Evan, and this is my third season acting as a company member with Princeton Summer Theater. My first summer with PST was in 2012, just after my sophomore year of Princeton. During the school year I’d performed in several shows with student groups and with the Lewis Center, but the twelve-hour days of PST were far more demanding than my previous schedules. Although I was (and still am) a little overwhelmed by the rigor of our program, I quickly fell in love with the community that we created together. Community is a word that gets bandied around a lot, especially on college campuses. The Princeton community, the theater community, the communities of eating clubs – they’re all groups of people with something in common, and they all have the potential to help their members grow and develop meaningful relationships. But where these groups allow members a degree of flexibility in their commitment, PST requires an intensity of focus. A full half of our day is spent rehearsing together, preparing and eating meals together, and operating the theater together. Of the remaining twelve hours, what we don’t spend sleeping is likely to be spent relaxing together after a hard day’s work. We binge watch Orange is the New Black, play games, and celebrate our latest shows. PST linked togetherness and community for me with a clarity that I had never experienced before. Although most of us in the company and board of PST were friends before this summer, we’re already much closer because of the time that we’ve spent together these last two weeks. We’re creating another beautiful, tight-knit, weirdo artist colony much like we had in my past summers. Every show that you see us put up is a product of that community, and a testament to its strength. I’m overjoyed to be part of this crazy adventure once again!